As it's been quite a while since my last trip out of the UK, on my last day in Rome I headed straight for Sephora to pick up some products I've been lusting after for quite some time! Keen to pick up products I couldn't get in the UK, I picked up mostly Sephora own products with a little bit of Makeup Forever mixed in too. Here's what I picked up. The first products I knew I wanted to pick up were the Sephora Cream Lip Stains (€10,90, $14.00) and after hearing about the varying quality of the shades, I opted for 01 Always Red and 03 Strawberry Kissed. I haven't tried out Always Red yet but I am really impressed by the staying power of Strawberry Kissed which is extremely flattering. However if you're looking for a good dupe, I think the Bourjois Rouge Edition Velvet Lipstick in Frambourjois is a very close match. I of course couldn't come home without picking up some nail polishes but sadly the Sephora I visited had a very small selection. I was after the Formula X range from Sephora but not to worry, I picked up three shades from the Colour Hit (€3,90) range in the form of: Sea, Sun & Fun, Blue Lagoon and a glitter polish which seems to have no name. So far I've only tried Sea, Sun & Fun and I'm really impressed by the quality. The polishes are on the small side but they are really affordable. I was taken in by the little travel size stand beside the tills so I gladly popped some minis into my basket. The first being the Sephora Outrageous Volume Dramatic Volume Mascara (€6,90, $5.00) which although travel size is a pretty decent sized mascara. I really liked this but my only problem is that it collects too much product on the wand so you do need to take off the excess before it even comes close to your lashes. Also in this section I picked up the Sephora Lingzhi Sleeping Mask (€3,90, $4.00) which I have yet to try. I was a little overwhelmed by the choice and with a flight to catch in an hour or two I picked the first colour I seen and I didn't realise it was specific to anti-aging. Never mind! I'll still give it a go but I'll be a little more observant next time. Last from the Sephora collection, I'd heard so many good things about their brushes so I picked up the Sephora Pro Ultra-Liquid Foundation Brush #83 (€25,90), which comes with a protective case for the bristles. It's an amazing brush that works really well with my foundation but I do find I need to use a lot more foundation with this than my other brushes. It wasn't cheap but for the quality I definitely think it was worth it. Last but not least, I saw that Sephora had a Make Up For Ever counter which we don't have here in Scotland (as far as I know) so I decided to pick up the Make Up For Ever Full Cover Concealer (€33,90, $34.00), in the shade 03 much to my surprise! I was worried it would be too heavy but all you need is a tiny tiny amount and the product goes a long way. I was really happy with this purchase. There you have it, my first Sephora haul! Annoyingly after typing up this post I realised I missed out one of the products I purchased but I feel it's unique enough to warrant it's own post. 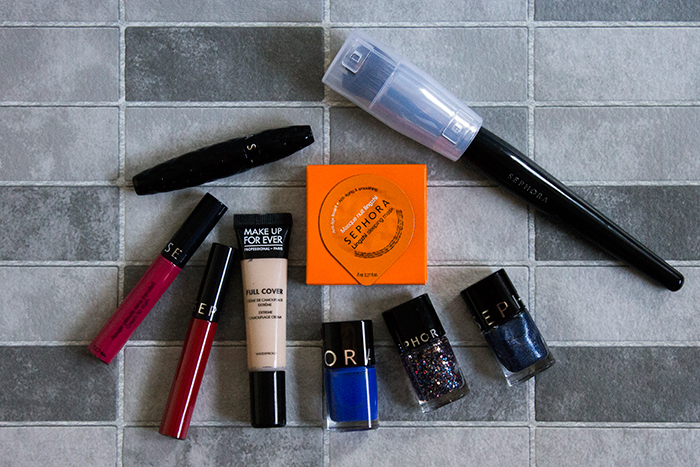 Let me know your favourites from Sephora, I'm sure I'll be well prepared for my next trip!